This is not meant to be an exhaustive deluge of stuff from this source, but I was prompted to delve in regard to the (justifiably) growing interest in the earlier history of A class diesels, in particular their appearance. Over time, I’ll throw in whatever other details strike me as being of possible interest to modellers. A subscription cost the equivalent of 15c in 1960......! So now you can say that your going to 'give us your 15 cents worth' on the matter . Believe it or not, I meant to write 15p sterling, or about 17 cents! So there’s two free extra cents! I'm reading forward from January 1960. First thing of interest is that in 1959/60, ten "C"'s were fitted with electric heating equipment. Clearly, it was not to prove successful, as subsequently tin vans were used. It seems that lining was first added to green-repainted As and Cs once they were repainted from silver, but new paint jobs (green, obviously) were seen by April 1960 with no lining. In spring 1960, we see the first instance of an ex-GNR dining car on a CIE line - Westland Row to Galway; plus a CIE diner (No. 2400) appearing on the Enterprise. Meanwhile, branch closures abound. Some lines are in an advanced stage of having track lifted, others are just closed, and announcements are being made that others are either under threat, or rumoured to be, or notices have been published. Interestingly, the West Clare, now Ireland's last narrow gauge system, is thriving and traffic is heavy. CIE appear to be making positive noises about its future (ten months before closure!) - so that's all right, then! By summer 1960, CIE have 140 steam engines nominally on their books. Many, however, are long out of use. 800, 801 and "Sambo" are among them. Almost half of the surviving steam engines are J15s. The UTA have started putting their full coat of arms on rolling stock, and repainting ex-GNR locos. It is thus certain that no GNR loco in UTA livery ever bore the older "Red Hand" emblem. On CIE, the first repaint of a GNR dining car into green has taken place, at the same time that the UTA paint an ex-GNR diner (88) in their dark green. By summer 1960, the UTA is starting to put the "wasp" stripes on railcars, and the first ex-GN BUT car has received UTA green. Closures abound again: now the West Cork, West Clare and Tramore lines are scheduled for closure. All are reporting record traffic! Thank you, Todd Andrews; you're responsible for both this AND Tubridy. Ghastly. The IRN mentions that the obviously planned closure of the West Clare is doubtless the reason that CIE didn't seek an stock off the Donegal. One would have thought railcars 19 and 20 would have come in handy, plus some carriages. Elsewhere, the IRN expresses incredulity that CIE would propose closing four Dublin suburban halts, and raises eyebrows at some closure policies. This is the difference between this periodical and the IRRS journal: we have here a refreshing look at the railway through open, measured eyes. The IRRS Journal has, inexplicably, throughout its 60+ year life, never, ever criticised the railway, even when clearly warranted. We'll finish 1960 and I'll come back to this in a while. I'm off on holiday for two weeks so expect radio silence for a while after this post! Fitting ETH to some of the C Class seems to have been part of a last ditch attempt to provide heating on passenger and mixed trains on short feeder branch lines in West Cork and in the Midlands and West of Ireland. 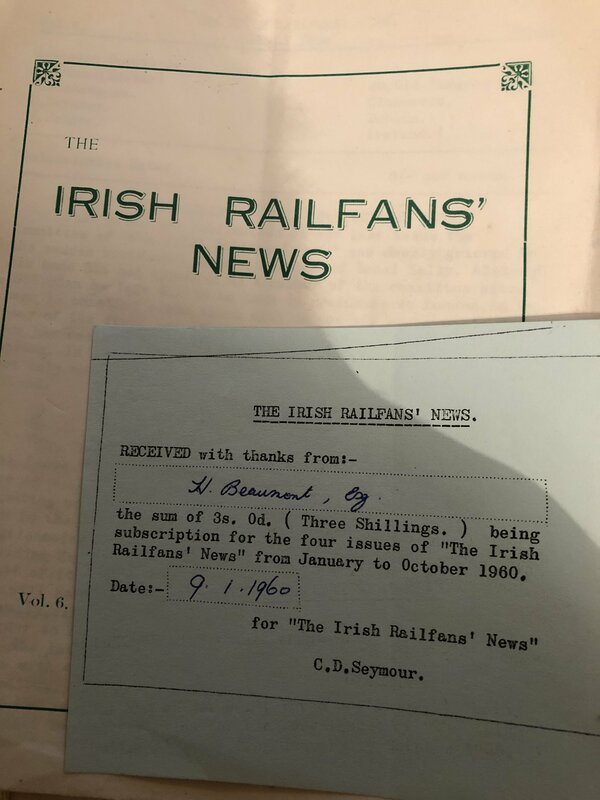 The saga of CIEs attempts to provide electric train heating on branch lines worked by diesel locomotives is covered in an earlier Irish Railfans News. Apparently an number of bogie coaches were converted to "self heating carriages" for branchline use with C Class locomotives by fitting small generator sets. The self heating carriages appear to have been intended for use on the one coach mixed train on the West Cork Branches, Ballina & Birr. The generator sets do not appear to have been too successful in operation and some C Class were fitted with ETH shortly before the West Cork & Valencia branch lines closed, leaving Ballina & Birr as the only branch lines with a diesel worked passenger services. Birr closed and Ballina lost its passenger connections from Manulla in 1963 leaving little or no regular passenger work for the C Class. Funnily enough there is a nice photo 1968 photo in the Irish Metrovicks book of a freshly re-painted C203 with silver ETH connection on buffer beam although in all probability the handful of eth fitted coaches had been withdrawn. In the photo C203 looks very smart in all over black livery with yellow warning panel & buffer beam, white cab band, tiny air horn and windscreen wiper on drivers side only. The “self heating coaches” as you mention are described in 1960, when some are still being converted as such, but even then it’s clear the writing is on the wall. More tin vans are being built. Onwards into 1961, and the northern government is practically in hysterics about closing every inch of railway they have, while Todd Andrews continues to work his destructive magic on CIE, albeit to nothing remotely like the harmful extent of William Craig in the north. An "A" class has made it to Warrenpoint, even as 11 NCC locomotives (W & WT class) are transferred by the UTA onto the GN section, and 466 (a Bandon Tank) has been transferred to Broadstone to shunt the Dublin area. GN 4.4.0s are appearing on Amiens St. - Greystones trains, and will occasionally shunt Dun Laoghaire's sidings. January 3rd sees the first two 121s appearing at Dublin Port. These are B124 and B126. More tin vans are entering traffic, the latest being 3148-52. No less than 40 new 30 ton guard's vans are being built, half with vacuum. For modellers, it would be the advent of these which virtually wiped out ex-GN and ex-GS guard's vans from CIE.
A point on guards vans in general: models frequently depict these with white roofs, which is incorrect, as is the Whitehead-inspired cream painted balcony insides. These should be grey. Guard's vans were usually painted cream, or cream upper and brown lower, INSIDE the van, but never, ever, on the insides of balconies as per "Ivan". On 11th December 1960, the UTA did a speed trial between Amiens Street and Belfast in one hour and 57 minutes. Almost sixty years later, despite eye-watering amounts of money spent on modern track and signalling, and less traffic overall, the "Enterprise" takes a lot longer. jhb171Senior often mentioned (as a retired PW Civil Engineer with vast experience), that it is utterly pointless spending huge amounts on track, when it will not be properly maintained after that. Modern machines do not, in his opinion, do the job that gangs of men did in the past. One might assign that to the thoughts of an "oul wan", in his dotage and out of touch with the modern world, but the proof is there: in the past, jointed track carrying much heavier traffic, and the stamping ground of steam engines, lasted a lot longer than modern track, with endless expensive yellow machines producing enough "data" to clog any memory stick. Back to the sensible days of 1961. 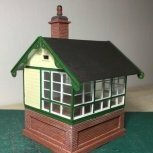 I recently commented on the absolute necessity for a RTR "AEC" set - or at the least, the certain necessity of having at least one such set on ANY layout of ANY Irish railway bar the NCC between 1950 and the early 1970s. Perusal of train operations over 1960-2 show a very clear pattern, in which roughly half of ALL passenger trains on all of the above-mentioned lines (GNR / UTA (GN), all CIE) are AEC sets. The rest are largely diesel locomotives. In the north, obviously, there aren't any diesels, nor will there be until the three 101s make their debut in 1970 - but on CIE, steam is now rare, and largely confined to shunting and goods. Steam still looks after the Loughrea and Ballinrobe and Ballaghaderreen branches, but even Loughrea will become the stamping ground of the G class within a year. Several trains of condemned steam engines are being taken from places where they've been lying out of use for years, e.g. Ashtown, where among the discarded relics even a D16 ("Achill Bogie") No. 523, slumbers among the brambles. Destinations are Dundalk or Inchicore for scrapping. Among the closures are West Clare and Tramore. The former has just three railcars (the fourth is in Inchicore; it's refurb will be terminated half way through); and the main up and down trains of the day consist of one of the "F" class diesels plus all three railcar trailers and the solitary C & L coach No. 1, plus an ex-Dingle passenger brake. That's the lot. Tramore has three AEC cars plus two Park Royals (1407/8), one fitted with push-pull and a window for the driver in one end. The Tramore line contains no other stock whatsoever. An aside: for a "shelf" or "fiddle" layout, a modern Tramore is perfect. Two small termini and half a dozen items of stock. Had the line survived, we might reasonably assume that today the entire line would be operated on the "one engine in steam" principle by no more than two two-car 2600 sets. Indeed, the two "bubble cars" might have found a use there - this pair plus one more 2-coach 2700 set. As they say at exam time, "discuss". What would have operated there in between AEC time and the mid-90s is another story; possibly a pair of 121s and 3 or 4 Mk 3 PP coaches might have ended up there! On the UTA, BUT car 122 has been the first to receive the new UTA crest. However, within months virtually everything on the UTA has both this (in place of the "red hand" thing), plus "wasp" stripes. For modellers, an important detail is that the red / straw / red lining on passenger stock (NOT straw only), was applied only to loco-hauled stock. All railcars were plain green. Given the UTA's strongly anti-rail policy, the Portrush branch was closed during winter months for several years at this time. jhb171Senior often mentioned that they were absolutely hell-bent on closing it permanently, and selling Portrush station as soon as humanly possible to prevent the railway ever operating into there again. Thankfully, sense prevailed. It's busier now than it's ever been in its life. Tramore would have been the same! So would Queen's Quay to Comber, and almost certainly Derry to Strabane. There's huge traffic between Derry and Buncrana - Luas, anyone? Meanwhile in Cork..... the majestic and underrated by modellers 400 class no. 402 is reduced to shuttling beet wagons to Mallow! GNR 0.6.0 158 is working Dun Laoghaire pier trains regularly, a duty which will also see a rare visit of a dirty blue U class 4.4.0; by now, as one of a number of GNR locos based at Broadstone (including the last 4.4.2T) it regularly works the Dublin - Clonsilla - Navan - Kingscourt goods. It is also spotted on a trial run with a long train of brand new 30T brake vans to Portarlington and back. By St Patrick's Day 1961, the day of that ill-fated epic journey of delays with an enthusiasts's special to West Cork, B133 took on the "Enterprise" - the first foray of a 121 into Belfast. These locos at this stage haven't operated in traffic on the Cork line - passenger trains are largely AEC cars and "A" class haulage - and they haven't seen a goods train yet. Over a few weeks, no less than 46 steam engines have been hauled away for scrap. The Sligo Leitrim railcar has been trialled in traffic on the Loughrea branch. On the last day of the West Cork, the normal three-coach AEC set has an elderly GSWR coach inserted into it as an extra vehicle. By then, while all main line services were AEC sets, there were always still a few very venerable old carriages kicking about in Albert Quay, typically used on Courtmac excursions. West Cork's last day saw C's out and about on branch and goods service, with C212 on the Clonakilty line and C216 on the Baltimore line. Ex-GSWR 4.4.0 No. 301 was now the only loco of that wheel arrangement in traffic, bar one or two ex-GN types in Dublin. On the West Clare's last day, F501 and F503 did the honours. By 8th April. Broadstone Shed closed. Its last inhabitants were four GNR engines (one 2.4.2T, one 4.4.0 and two 0.6.0s), a J26 0.6.0T, four J15s, and six others of various types. Now, Amiens St. was the last steam shed on CIE.
By the end of April, while the "Enterprise" is primarily AEC cars, a B121 class is regularly on the 11:00 down and return. The UTA would reduce the train service on the Warrenpoint line to just one (useless) return a day.K801, now in CIE green, was reported operating Cobh locals. All DSER and Galway main line trains were AEC cars. B101s monopolised the Mallow - Waterford line, and put in an occasional run on the North Wexford and the North Kerry, while the "A" class were all over the main line to Cork, and the South Kerry. A GNR 2.4.2T (the last one) was now transferred to Inchicore from Broadstone and was station pilot at Kingsbridge. It was quite remarkable to note that B1a class 801 was retubed as late as June 1961, for the large IRRS / SLS / RCTS all-Ireland steam tour. By now, 802 had been scrapped and 800 was stored out of use in Thurles. No less than FIVE steam engines, however, were under repair in Limerick; 151, 172, 262, 574 and 583. Three others were receiving light repairs there too. Ex-GNR No. 85 "Merlin" was returned to traffic in May 1961, but apart from doing pilot duty at Dundalk, had only worked two Dundalk - Dublin locals. An ex-MGWR "J18" 0.6.0 was going round the houses with the weedspray. New CIE dining cars (2400 series) are reported as having upholstery in red, blue and turquoise. Carpets were "charcoal and yellow". Summer 1961 - and the only REGULAR steam anywhere on CIE is the Thurles-Clonmel goods, and the Ballaghaderreen and Loughrea lines. The Sligo railcar has now been taken from its very short lived spell at Loughrea, to the Nenagh branch. It is now in CIE green, with a black roof. The first ever visit of a B121 to Portrush (have there ever been any others??) took place in the summer, when B121 itself took four bogies there on an excursion. It couldn't turn there, reason not given, but the turntable was likely in poor order, so it returned CAB FIRST as far as LISBURN! But with no diesels, the UTA was continuing to shop steam engines - with two ex-GN and two ex-NCC being treated, and three more in line. Nos. 72 and 84, the last two NCC "Scotch engines", were at Adelaide for sale - the last of this class in use, though they had been out of use for a while. The NCC was now almost totally the preserve of the motley collection of MPD railcars, and "Jeep" 2.6.4Ts. Several "W" class 2.6.0s were now working goods on the Derry Road, along with ex-GN types and (of course) AEC railcars on passenger. Passenger diagrams on the Derry Road show nine sets in use - three steam and six AEC railcars. Locals between Belfast, Lisburn and Portadown see the odd GNR 0.6.0, but are mainly AECs. By summer 1961, all the UTA's ex-GNR railcars (AEC and BUT) have been repainted in UTA green. In Inchicore, the season had seen the works build no less than 200 "H" vans, 20 goods brake vans, 14 laminate carriages, and 5 "hot water bottle" tin (heating) vans. meanwhile, Maybach had agreed to supply 14 engines for the "E" class shunters, currently on the production line. While a new livery of red and cream for culchie buses, and navy and cream for jackeen buses, had been trialled, it was now reported that a new livery was being tested on railway vehicles. For years, CIE and the IRRS Journal would doggedly refer to this as "golden brown" or even "brown", black and white; as we know, it was anything but. Granted, it wasn't quite "orange" but it would be more accurate to call it a browny orange, than an orangey brown... however, in this instance the IRN also referred to it thus! Irrespective of the description, we see by summer 1961, that A6 has it, along with two laminates, two tin vans, and two heating vans. It would be well into 1962 before this new livery made any great inroads into the land of green stations, green locomotives, green carriages and grey wagons; the "grey/green era" in its Indian summer. Having been retubed, 801 "Macha" was still regularly in use on Cork - Limerick Junction goods trains. Externally, it was very shabby looking. Four ex-GNR 4.4.0s including 207 "Boyne" would appear from time to time on Inchicore to Portarlington trial trains of new or refurbished stock. The other ex-GNR beast in traffic, the diesel K801, was again out of traffic (and in fact, would rarely work again), and two Bandon Tanks were substituting on the Cobh line. I'm pretty sure one of these was painted black by this stage. Several ex-GNR AEC cars were noted among CIE ones on the Sligo line. AEC sets were the standard accommodation on this line by now. Other ex-GN BUT double-ended cars were being converted to powered intermediates. These were now being noted on AEC expresses on the Cork line. By autumn, B121 types had taken over some Cork workings, which in the recent past had been shared by AEC sets and "A" class haulage. But they were still not passed for goods anywhere. On 30th July 1961, it was a big day for the GAA in Limerick. Without delving into the fascinating narrative of what happened all day, it is worth picking out what haulage was on the specials. AEC trains of six cars operated, plus "A" classes on other trains - no steam. One special (from Blarney (Mainline) had A17 with no less than sixteen 6-wheelers, one old bogie and a (modern) tin van. By now, few of these were in traffic anywhere except for the reserve stock of them held in Cork, mostly for summer Youghal excursions. As an aside, it's worth mentioning that no passenger-carrying six-wheelers ever became black'n'tan, though about four full passenger brakes (all of GSWR parentage) did. CIE, as well as the UTA, were still using AEC sets on some cross-border services. However, as far as CIE was concerned, diesel locos were more to the fore on this service. The summer of 1961 was the forst time that even on the NCC, with no diesel locos at all, steam was little to be seen, even with peak summer traffic. Almost all was MPD cars. Seven "WT" and six "W" class ex-NCC steam engines were in use, but mostly on the GNR section, where the W class were working Derry goods trains quite often. "Jeeps", on the other hand, seem to be almost totally on Belfast - Portadown. Weight restrictions kept the W class off Derry passenger trains, which were eithet AEC railcars or hauled by a dwindling band of ex-GNR U and UG class. 7 specials ran off the GNR onto the Bangor line - three of AEC sets and one with an "A" class - possibly the first visit of one of these to Bangor? Steam operated another three. Orangemen's events at Lurgan produced an interesting day, with sixteen specials from Belfast. A Bangor line MED set did one, ex-GNR "VS" class 4.4.0s 58 and 59 did one each, and the other thirteen were AEC cars. Another MED set ran as far as Lisburn. By the autumn, only a single NCC section passenger working was regularly steam - the 07:00 York Road to Antrim and return. NCC goods services, obviously, remained steam - one must assume Jeeps were in use on this. One interesting working the following day saw blue U class No. 68 leaving Bangor with a train of "flat sided coaches". These would have been elderly Belfast & Northern Counties non-corridor stock - few of these would still have been in use by this time. By autumn, a "Jeep" had reached Warrenpoint with an excursion. Passenger workings into here were mostly diesel, of course, with the old Gardner GN railcars "D", "E", "F" and "G" (now renumbered 101 upwards by the UTA, and in green) taking turns. By the onset of the winter, the now-familiar black and white tiles in station concourses made their first appearance in Limerick. Many other stations were now being modernised, and repainted in schemes away from the time-honoured dark green and cream. After just a few years of this, the all-encompassing white, black and several grey shades would become universal on CIE (and very tidy it always looked). On 3rd December, the first trial of double heading the B121 class occurred, across the Shannon bridge at Athlone. One ex-GN AEC car was recently turned out (December 1962) in the new black'n'tan. It was painted in Dundalk Works; how many other vehicles* - if any - were thus painted here? Shortly afterwards, the works would leave railway ownership.... It had now been decided that this should be the new livery, and several other vehicles had received it in Inchicore. By autumn 1962 this livery would begin to be seen everywhere, though green locos and stock would be about for a few more years. I think the last green stock seen was about 1967. GSR Dining Car 2401 was noted alternating on the CIE Enterprise with ex-GNR diner 401. The seven new G class appeared in December 1961 - though one of the earlier trio was reported out of use! The reality was that these locos arrived after there had ceased to be any clear rationale for having them. On 23rd October, a six-car AEC set carrying De Valera to Killarney, became the first complete train to run in the black'n'tan, which would in various guises be the standard set of colours used for the rest of the century and beyond. As the year closed, ex-GN 85 is retubed, NCC 104, the last "W" class 2.6.0 on the NCC, has been shifted to the GNR, and two ex-GNR 4.4.0s are spotted on trains of turkeys for Christmas at Athlone! There is a CIE publicity photo of A6 apparently hauling a train made up of AEC Powered Intermediates & the State Coach passing Headford all immaculate in the black'n'tan livery.y. 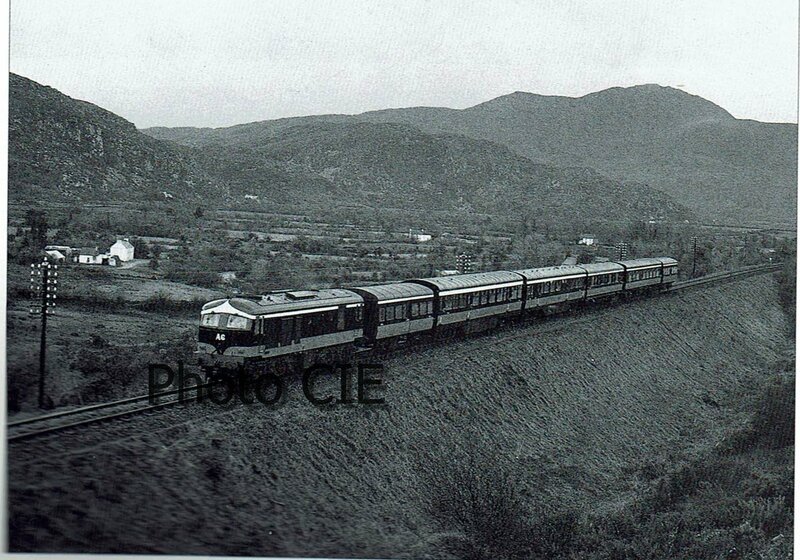 There is a CIE publicity photo of a "Modern Passenger Train" made up of A6, what appears to be a trio of powered intermediates and the state coach. A6 was the guinea pig for the black and tan scheme, the powered intermediates converted from the Bullied slab fronted railcars around the same time. The railcars still have their side skirts hiding the mechanical bits. The formation of hauled railcars on a mainline passenger train appears odd, the last vehicle appears to be a luggage rather than a heating van. Were the railcars used because they were the only black'n'tan coaches available or to provide a means of getting the President home with the least disruption if A6 broke down. With the delivery of the seven G61x class, it was noted almost immediately that there was nothing obvious for them to do! By February. only G601 of the original trio was doing anything at all - an occasional bit of shunting at Portarlington. The other two would scarcely turn a wheel - if at all - in traffic again. Yet, all three ended up being repainted black. More new carriages were coming on stream, and alterations were taking place to the internal layout of several ex-GN dining cars; former GN stock as well was almost all now in green, be it of the UTA or CIE persuasion. Black'n'tan was now beginning to be noted all over the place, with tin vans now often also in this livery. 801 "Macha" was now noted working INTO Limerick with the Cork goods, instead of leaving it at Limerick Junction. But by spring 1962 she had developed an in=named fault and was stored next to 800 in Thurles out of use. Even now, three J15s were outshopped from Limerick Works, and a Midland 0.6.0 was also receiving attention there. When I started looking through these journals the other day, I KNEW there was something in there somewhere that I had forgotten about, regarding liveries. In February 1962, A31 appears in full black'n'tan (high waistband), as the first A in the now standard "proper" black'n'tan livery, as opposed to A6 in its experimental version. A6 would soon be altered to the "standard" style. BUT - at the SAME time, A16 has been repainted fully in "the former SILVER livery"! The IRRS, meanwhile, organised a special on St. Patrick's Day, which brought ex-GN 207 "Boyne" to Cork. With only months to go until steam ended for good, in Cork J15 193 was completely serviced and repainted in the standard grey livery, but with (uniquely) a black smokebox and chimney. Months later it would be on the scrap line. For the rugby, two specials headed south from Great Victoria Street to Amiens Street in February. Both were hauled by ex-NCC "W" class 2.6.0s.Other specials were hauled by A, and B101 classes, and one with ancient GSWR 4.4.0 No. 59. On Lansdowne Road locals, we see A14, GNR goods 0.6.0 No. 170, and two locos numbered 197: a CIE J15 and a GNR 4.4.0! St. Patrick's Day saw six specials on the Belfast line, all hauled by "A" class locos. Meanwhile, in Limerick, it is often thought that the cement line to Castlemungret was always the preserve of diesels, as it was only opened in these times. In fact, steam featured at first and in spring 1962 the branch was worked by five J15s (101, 106, 124, 138 and 164). MED cars 24, 26 and 28 had been fitted with driver's controls and an end window in the guard's compartment for operation off-peak on the Bangor line as a single car. The Belfast Central line was now to be closed, rendering the Bangor line as a Tramore style unconnected suburban line. A nonsensical decision, even by the negative standards of the UTA. Six "WT" Jeeps plus ex-GN 208 had been refurbished at York Road. Steam was still alive and well in Belfast, just for another few years. The 09:15 down "Enterprise" was noted one day with three AEC cars in CIE green, one intermediate in black'n'tan, the dining car in GNR navy & cream, and a silver tin van! Such multi-coloured scenes were to be common on both UTA and CIE for a few years. I recall seeing, a few years later, an AEC set in Lisburn with one UTA green car, one in UTA mid-blue and cream, and one in the brand new NIR maroon and grey.... More colours abounded in Amiens Street, with the pilots being 0.6.0 117N in GNR black, but running with the blue tender off 191N. It is noted that by summer 1962, all passenger trains (bar the odd special) on the Derry Road were AEC railcars, except the Derry - Strabane & Omagh locals which were ex-GN Railcar "A", now UTA 101. A rare visitor one day was Jeep No. 55 due to a railcar failure. The "Jeeps" rarely ventured onto the Derry road, and never regularly. As if the closure mania wasn't enough so far, now Andrews announced another 23 branches and marginal routes as being listed for closure. The North Kerry was one significant one, in terms of passenger trains, other branches would close completely. By now, it was noted that passenger trains Tralee - Limerick were all AEC sets, with the same sets providing the Limerick - Athenry - Claremorris - Sligo services. Sligo was railcar heaven (as it is now....!) with AECs monopolising Dublin services too. The new G class all entered traffic in black'n'tan (NB: NOT green as on G611 now; none of these locos ever turned a wheel in green). G611 was on the Foynes mixed based in Limerick, the only passenger use of this class apart from Loughrea. G613 was shunting Kingsbridge, and G614 at Dundalk. G615 was based at Grand Canal Street as the Liffey Junction pilot (!!! WHAT would it be able to PILOT!)?. It seems that G612 was spare. G613 would later go to Loughrea. It was reported that the original trio would be fitted with vacuum brakes. They never were. Meanwhile, B110 became the first of its class to become black'n'tan. During the spring and summer of 1962, numerous specials were operated in connection with various sporting events. It seems that all were either hauled by A class locos, including one from Belfast, or AEC cars. Three more J15s had been refurbished, however, and with more railcars seemingly needed in Dublin, a "C" would take over (for a while) the long Sligo to Limerick trains. I wonder were they ever on time! A "C" also worked the Nenagh branch, as the Sligo railcar continued to be reported as unreliable. The reality, in retrospect, seems to be that despite Inchicore's long history of diversity of classes in the steam era, anything diesel that wasn't standard was not properly looked after. The GN diesel, K801, the Sligo railcar, and the G class, were all things reported as unreliable and troublesome by Inchicore for all the time they had them. In fact, they were all of tried, tested and highly reliable types used elsewhere. CIE clearly had no interest in them, and blamed the disinterest (or failings of fitters) in the excuse that these beasts weren't any good. The summer timetable had all NCC passenger services as MPD railcars, bar two Larne line workings and one Ballymena - Antrim local. An increase of services on the Derry Road meant that now one extra service was steam, with everything else AEC and BUT cars. Steam, of course, had control of all UTA goods. Jeeps on the NCC, with W class and a few GN locos on the ex-GN section. Other Jeeps were on various local duties on the Belfast - Portadown line. A two-coach AEC set was now working the Thurles - Clonmel passenger train, with various J15s operating the goods, including the elderly unrebuilt 162, which was stationed at Clonmel. Other J15s were still to be seen, mostly on pilot work, in this general area. Kilkenny had a "C" for the Castlecomer line and for pilot work, though, and a "C" was in use on Limerick - Waterford goods trains, while a three-car AEC managed passengers. The 141 class were being delivered in autumn, and the last arrivals were scheduled for December. 1963 would see their introduction into traffic. Inchicore had built its last complete wooden framed coaches. It was announced that an order had been placed with Cravens of Sheffield.....need I add more? 1962 would be the last year with neither Cravens nor 141s; both would appear in 1963, even as the very last steam engines breathed their last. CIE's last new laminates were complete and in traffic - these were composites 2176-9. MGWR 0.6.0 599 had now also made history. It emerged from a major refurbishment from Limerick Works in August 1962 - Limerick would never again overhaul a steam engine. Cork continued, though, with DSER 461 receiving attention there. The last serviceable "Woolwich" 2.6.0 set sail from Cork, picking up a J15 and J18 (both withdrawn) at Portarlington, en route to Mullingar. All three would be scrapped there, along with another half dozen locos. GNR 132 and 207 "Boyne" were, however, on trial train duty at Inchicore and made several forays to Port Laoise in this guise. The All-Ireland final saw specials headed by A class primarily, but UTA 4.4.0 62 had one, and two others were in the hands of B101s. A "W" class 2.6.0 had one from Derry (Foyle Road). A B121 appeared from Galway. Elsewhere, B129 had a special for the ex-US President Eisenhower. The whole train was freshly painted black'n'tan. Mention of this, and the famous derailment of E421 on a trial run, shows up also what was generally running on the main line. AEC cars were no longer monopolising all main line passenger routes - the new "Yanks", plus "A" class locos and (further south) B101s were making their presence known. Meanwhile, the AEC cars, many having been heavily worked, were converging on Dublin where they would now become more and more the staple of Dublin suburban services. That said, their main days were still far from over. The UTA "Enterprise" remained primarily AEC or BUT railcars, but in the summer when it was heavy, a "W" class 2.6.0 was used once, with ex-GNR 4.4.0 No. 58 used on other occasions. Ex-GNR 0.6.0 No. 47 was still bumbling about and would appear on occasional passenger specials - I remember it well myself. "Jeep" 55 had a complete "deep" overhaul, as did GN 4.4.0 No. 66. Summer traffic on the NCC, however, saw some trains double headed by Jeeps; the next few years would be their swansong. A GNR 0.6.0 shunted York Road too. One special saw GN 4.4.0s on train out of Foyle Road; No. 60 as far as Strabane, and 63 after that. It was the August bank holiday weekend, so traffic was heavier than usual, therefore the down train which was crossed at Beragh also was steam hauled, by another GN 4.4.0. On Orangemen's days, the following locos were on specials: 4.4.0 No. 62, 4.4.0 No. 60, 0.6.0 No. 47, 0.6.0 Nos. 44 & 45, 0.6.0 No. 49 (which I also remember well) and a seven car BUT set. By mid summer, passenger services on the Derry road were again almost entirely AEC and BUT sets. Meanwhile, the GNR "DIrector's Saloon" No. 50 was now in UTA green. I saw it like that on the official last steam train from Belfast to Dublin. Now; it's half past eleven and I've to get up in the morning to go to Thailand for two weeks, as one must. So 1963 will have to await my return. Good luck to yiz in the meantime! Thanks @jhb171achill you are the 'oracle' and fountain of most interesting knowledge. Fascinating, and thanks for posting. I post all this stuff in the hope that it will (a) set the scene and background for the forthcoming RTR J15, 121 and A classes, (b) engender increased interest in the fascinating "green/grey" era, when elderly steam and brand new diesel could be seen hauling venerable gas-lit wooden non-corridor stock, alongside (for all too brief a few months) brand new steel stock, (c) provide information to those too young to remember on what the railways were like in their timeless Indian summer, even as modernisation crept it. So long ago in one sense, and in another railway world, but in reality all too recent. I'll make a start on this - I'll hardly get it done tonight. Trial runs with the new 141s began on 24th November 1962, just as cutting up of B1a 4.6.0 801 "Macha" started in Inchicore. These locos are often referred to as "Queens" - even by IRN. This is completely wrong, akin to calling a "Woolwich" an "N" class after the narrow gauge equivalent in England. Maedb was a queen, but Macha and Tailte weren't. The first use of a new 141 in traffic was the 06:30 Dublin - Cork on 10th December 1962. Later, the same day, examples of the class took the 10:40 Dublin - Cork (with two locos; first ever double headed 141s), the 11:00 Enterprise, several afternoon trains to Cork, the 20:10 night mail double headed to Cork, and the 21:45 Dublin - Limerick goods. One loco had been sent to Claremorris for crew training, but it would be 1963 before they were out and about on the Midland or DSER sections. The only regular steam in Inchicore now was stationary boiler duties, for which GSWR 2.4.2T No. 42 had replaced 4.4.0 No. 301. Down in Cork (that's Caaark, boy!) to those of a southern persuasion, C class locos were working the quays shunting, and the Albert Quay yard. And steam continued its swansong. The beet season finished up with several GNR locos joining the usual J15s which were all over the place, but mostly in the south east. One GNR loco (0.6.0 No. 161) got as far as Ballylinan. Ex-DSER 461 also took part, as did sister 462, despite this loco having been in and out of traffic in recent times with unspecified problems. Some fifteen steam engines were used in the south east, with seven others elsewhere. Apart from those singled out above almost all were J15s, having outlived so many of their newer and more complex sisters. But Tuam was seeing diesels on beet now; the writing was clearly on the wall. In the west, the only beet train which was regularly steam was from Craughwell to Tuam, which ran a number of times, using one of a trio of surviving J18 0.6.0s. Twelve wheel GSWR diner 353 was now repainted in black'n'tan (from green), along with several ex-GNR K15 open thirds, while Inchicore stepped up completion of remaining laminates. Now preserved C231 operated the Roscrea - Birr line on its last day - both passenger and goods. Meanwhile, C212 had the same melancholy duty on the Banagher branch. The last Port Laoise - Kilkenny train was handled by new B159. Its opposite number was hauled by A45. I wonder was this the only outing of a B141 on this section? There can't have been many. Yet, CIE announced FURTHER closures in the near future. Waterford passenger trains were all in the hands of AEC cars at this stage, and the service was speeded up with a railcar express up in the mronings. This was to compensate for the elimination of the shorter route through Abbeyleix, and the Carlow / Athy diversion. Due to heavier than usual traffic, an extra goods train often ran from Limerick to Athenry and back. It was noted that this was regularly steam. The old Gardner railcar on Derry locals was withdrawn following a mishap with 0.6.0 No. 33 in Foyle Road station. Henceforth these services would be worked by a single BUT car. During the spring, York Road had refurbished no less than seven steam engines, of both NCC and GNR parentage. At this stage, 121 class locos would occasionally work nose-first. Due to the failure of B123, operating nose-first, B126 was attached to the front to complete its Dublin - Waterford journey, with four bogies and three tin vans. This is the first time a pair of 121s is believed to have worked with the locos connected "nose-to-nose", as would become standard ten years layer. A snapshot on 29th December of operations shows the Cork line largely in the hands of A and B121 classes, with AEC railcars on the Thurles - Clonmel line. A B101 is noted approaching Dublin on a goods. A's are also seen on beet.B101s were on the Waterford - Mallow line on goods and beet work, with Rosslare - Limerick passengers all in AECs. By spring, any "Bredins" still without gangways were having them fitted. By now, No. 151 was the last J15 still in working order and in traffic. It hauled an enthusiast special to the Streamstown - Clara branch. It was out again on 18th March for Ballylinan on another enthusiasts' special. On the Midland, 2nd February had seen MGWR 0.6.0 574 take the last services in and out of ballaghaderreen; now there was nothing more for this loco to do. The very last train off the branch was a cattle special for Sligo with B133, only the seconf time anything other than steam had traversed the line, which would now close. The other time had been the year before when a new 121 went in there with an enthusiast special, following the failure that day of the booked steam engine. Diesel reigned elsewhere - C221 had the last train to Newmarket, while final regular passenger trains into Youghal wre 141 and B101-hauled. Foynes' last passenger train was also hauled by a B101. The North Kerry passenger service was also finishing - two-coach AEC cars doing this job until the end, while B101s regularly did the goods, though the odd A served too. B135 took the last trains over the North Wexford, along with A31 and B141. The Bagenalstown - Palace East line saw its last ever movement with what as far as I know might have been the only working ever of an A down this line - on 24th March, A4 had taken a cattle special out of Borris, with 24 wagons and a van. Edenderry's last train also was hauled by a loco which can't have ever visited much - B173. How many 141s ever went there? Probably a one-off? By the end of March, steam was clearly on the very last of its legs. Its slow death, first predicted eight years earlier, was now a mere twitching of the feet of a shot animal. Drogheda lost its steam pilots in January, on the arrival of two "A"s. The 07:48 to Howth and back, Dublin's last regular steam working, ended on 8th January. C, E and G class diesels took over shunting and pilot work almost everywhere, though J15 151 would pop up on the Dun Laoghaire mail trains now and again. Only seven locomotives were steamed daily. Three pilot engines at Amiens Street, train heating at Kingsbridge and Westland Row, one for engineering trains, and one as a banking engine at North Wall. But more E class diesels were appearing - this wouldn't last. On 30th March, two "E" class diesels finally replaced ex-GN 143N on Amiens St goods pilot and 15N as the North Wall banker. Even Loughrea had succumbed on 4th February, when MGWR 0.6.0 583 had been replaced by a G class diesel. Steam had finished; 1834-1963, RIP. Fifty locomotives went variously to Mullingar, Inchicore and Dundalk for scrap. It looked as if finally, all steam working on CIE had ended. And yet, at the eleventh hour, Bandon Tank 463 briefly struggled into action on West Cork lifting trains. And of course, there was still the UTA. I sometimes wonder if the G Class were introduced with the intention of using them to station staff rather than drivers operating the locos at the larger wayside stations and smaller yards. Shunting tractors like the Duetz were in widespread use on the Continent, at one stage nearly every medium sized New Zealand Railways station had a shunting tractor usually driven by a depotman or shunter. Currently rail tractors are used mainly at industrial sites for shunting/marshalling rakes of container wagons for collection by Kiwirail from private sidings. Interesting thought re the G class. With regard to the railcars in use as hauled stock, as they had vacuum brakes they were used (as IRN shows) more than once as hauled stock for relief trains. Not just relief; they operated the timetabled passenger and (Ireland’s last) mixed trains on the Loughrea branch for over ten years, and for just three months G611 did the mixed to Foynes before being replaced by s C.
Other than that, though, they never operated passenger trains of any sort until the DCDR came along! Regarding the purpose in mind when they were ordered, it was this. If we look at the system before the 1963 closures, there was a great deal more light shunting, and light branch lines. The work done by the earlier trio on goods branches with 5 or 6 wagons in a single train was ideal, as was pilot work in places like Mallow, Tralee, Athlone, Wexford or Dundalk. On the GNR, one would have been useful at Clones and possibly Monaghan, and a goods only Belturbet branch would have made an ideal home, as would the Courtmacsherry line. The E class were ordered with a clearer view of the future. So, while it was thought that they too might suit some branch lines, the main focus was shunting and pilot work. The 1962 trial run derailment of E421 put all thoughts of using Es on trains above 25 mph in the bin. Station staff wouldn’t have been allowed near them (officially anyway!) due to union rules. A note mentions the last passenger train from Limerick to Tralee. The normal two-coach AEC set on this occasion, as a one-off, hauled a "new second, No. 1502". As mentioned in the last post, while steam was now history on CIE, they did retain a sizeable stock of serviceable locomotives, as a precaution in case some major unforeseen issue might afflict the new diesel fleet. Thus, many locomotives were not officially withdrawn until the end of 1965 - but for the historian, it is important to note that doesn't mean that steam was in use until then. Far from it - not one of the reserve locos would ever turn a wheel in traffic again, bar the few used on the 1964 all-Ireland RCTS steam tour. Most would be scrapped, but as we know, ex-GN 131, 90, 184, 186 and 461 would find their way into active preservation, with the old No. 36 plinthed in Cork. West Clare 5c was by now plinthed at Ennis on the site of the former WCR loco yard. Two Cavan and Leitrim engines and one T & D would survive, but that's for another day. The UTA proceeded to overhaul nine steam locos, of which five were "Jeeps", one "W", and two GN 0.6.0s. Ex-SLNCR "Lough Erne", now also numbered 27, had just emerged from the works and would spend all its UTA life shunting around York Road. With CIE now all diesel, the Dundalk banking (steam) engine was gone. G614 had appeared at Dundalk as a shunter, and it would have been utterly incapable of banking anything heavier than a Dunnes carrier bag. Thus, the northern section of the goods train, now worked almost entirely by "Jeeps", often did two runs between Dundalk and Goraghwood. Ex-GN SG and SG2 class 0.6.0s would occasionally work these trains, having the same haulage power as a "Jeep", but these GN engines stayed mostly on the Derry Road, where they were very much to the fore on goods traffic. Unusually, Queens Quay (the erstwhile BCDR terminus) refurbished five ex-GN AEC railcars, as well as its usual diet of Bangor line MEDs (the single least comfortable railcars ever to run in Ireland; albeit only marginally worse than the utterly dreadful NIR "Castle Class"*). Several new Portadown locals were specifically in the hands of ex-GN BUT cars. As these cars had no forst class, they were particularly allocated to these services which were advertised thus as second class only. And just like West Cork, Warrenpoint station was completely refurbished and repainted. Closure couldn't be far away! An ex-GNR bogie parcels van, 780, appeared from Dundalk paint shop in black'n'tan; while F501 was taken to Inchicore and the ex-GN steam crane was sent with match trucks to Waterford. By June, a pogrom of small rural intermediate stations had occurred. No less than 33 stations closed completely, with another 20 surviving only for certain types of traffic - this was usually goods of some sort, with passenger services withdrawn. And from the bizarre to the ridiculous; the last two trains into Athboy were worked the whole way from Dublin by G612! (They must have departed just before the Great Famine....). One, on 29th March had eight cattle wagons, and the following day the other - the very last train on the line - had seven cattle wagons from Loughrea Fair, plus four empty wagons for the collection of signalling equipment. Now the line was shut. The Oldcastle line, by contrast, required A34 to handle 24 wagons on the goods the same day! A55 would take the last ever train - 20 wagons and van - out of Oldcastle the next day. (* The term "450 class" for these abominations in recent years appears to be a gricer term - railwaymen always called them "Castle Class". And no railwayman EVER referred to the 80's as "Thumpers". Dammit, do they LOOK narrow gauge?). Absolutely fascinating stuff JB!!! Thanks for sharing. Back from the tropics now, so back to delving, and we're now in 1963. With steam finally dying on CIE this year, it was a truly momentous year in Irish railway history, and this huge change in motive power over the previous decade was now focussing minds on the strengths and weaknesses of the new forms of propulsion. AEC on almost all secondary passenger services, and many main line ones. Steam everywhere else. AEC and A class on main line, secondary and suburban passenger, and A, B101 and C joining steam on goods. Steam still on many branches and pilot working. The B101 class are seen as "southern engines", being based in Cork, Limerick & Waterford. Unlike other diesels, they are not to be seen all over the system. B101s are mainly active on Rosslare - Waterford - Mallow - Cork, Waterford - Limerick, and Cork - Tralee, but make more than a few appearances on the North Kerry (normally AEC on passenger and "A" on goods) and Limerick - Sligo less often. The B101 class are also occasionally to be seen on the DSER but rarely on the ex-GN lines, and almost unheard of on the Midland. This will remain their lifetime habits. AEC graduate towards Dublin suburban mostly, with A taking the lead on other passenger trains for a very short time until the B121s and B141s are in use. C's on remaining branches as they close. A, C and B101 on goods. Steam on a few branch duties and pilot work, very occasional goods e.g. beet and cattle specials. The "Yanks" take over passenger work very substantially. The increasingly unreliable A class are largely on goods now, and the even more disastrously unreliable C class are mostly on pilot work now, with rare appearances on passengers trains. AEC cars now in Dublin. Steam gone. In 1963, it is noted that on average only 12 of the 34 "C" class are in traffic at any one time. With their branch lines (e.g. Birr, West Cork) gone, they do little but pilot work. The rest await on the Tiresome Long Term Illness Siding at Inchicore for their next appointment with the long-suffering fitters. Then somebody suggests new engines for them! It was noted, though, that with the B121 and B141 class spread thinly all over the system, while many opportunities presented themselves where double-heading would be beneficial, rarely were there two of these classes in the same place, at the same time, and available for such duty. Thus, their 950hp power was an operational limitation. However, the C class, even when working, were worse - it was noted that five bogies was as much as one could deal with in realistic terms. The newer E class had proven unstable at speed, and were thus confined to shunting around Dublin, though two were allocated to Cork and one to Limerick. A G was in Tralee to handle the Castleisland goods and shunt. Another G had for just a couple of months dealt with the daily Foynes mixed - in between the end of (J15) steam there, and the end of passenger services in '63. With all the new locos, especially the B121 / B141 classes, plus further closures of smaller intermediate stations, many passenger services were considerably speeded up. The Dublin - Galway service had a full half an hour knocked off it.The final trains on the Sligo - Claremorris and Tralee - Limerick sections were, as usual, AEC railcar sets of three cars. The "Burma Road" one trailed a tin van - AEC sets were often seen towing all manner of items - from six wheel coaches to tin vans to having Park Royals or even older wooden corridor stock as intermediates. Now, the Limerick - Ballina service, bereft of its railcar, would switch to a 141 and coaches - a pattern maintained until passenger services ceased in 1976. Naturally, many many steam engines were now lined up for scrap, including old GNR types. On 10th June, J15 151 was steamed and went from Amiens Street to Bray and back, the purpose for which being unclear. Prior to that, 184, 111, 187 and 151 had all been in steam for filming purposes in the spring, but this jaunt to Bray does appear to be the last time any locomotive was used by CIE for any sort of normal use, even if apparently it didn't haul anything. I say "normal" use; two weeks later the old Cork gantry vertical boiler locomotive "Pat" was steamed for an IRRS group. This left locos in store at various locations, but the vast majority in Inchicore. Elsewhere, lifting of closed lines continued in the vicinities of West Cork (with a C class on lifting trains), Port Laoise - Kilkenny, Birr, Ballaghaderreen, Mountmellick and Banagher. Other lines slumbered, the cutting torch hanging over their heads; now weeds would gather, soon the track would be removed. Not quite yet, so Newmarket slept, as did Ballylinan, Oldcastle, Edenderry, North Wexford, and Bagenalstown - Palace East. I remember the eerie sense of an abandoned Palace East when jhb171Snr took me there just after the track had been lifted. A farmer with a shotgun, to whom I assume the land had just been sold, kindly advised us where we ought to go, and how quickly we ought to go there. The UTA was still whinging about how much money it was losing. Paltry by todays standards, at £438,000, but not really all that enormous by the standards of the day either. Some creative accounting ensured that the road services showed up as best as they could, while the railway showed as financially bad as possible. However, some stations on the Derry Road were being smartly painted up and renovated; obviously, closure couldn't be far away! Victoria Bridge, Pomeroy and Sion Mills all won best-kept station prizes. Yet, they increased their steam fleet. Loco shortages on the ex-GNR section meant that three S class and one Vs (170, 171, 174 and 207) were now being bought from CIE, who had inherited them in 1958 but with the end of steam had no use for them. The blue livery, albeit so filthy that it could barely be seen, would grace the Derry Road once more, as buoyant passenger traffic meant that steam hauled passenger trains would not entirely be displaced by AEC and BUT cars on the Derry line. In contrast to what CIE were doing, it's interesting to see what was working on the UTA. The last ex-NCC 0.6.0, No. 13, wasn't doing much and would be withdrawn soon, but was noted shunting York Road, despite having been out of use for a while. York Road (or Duncrue Street, as they now called it) had recently overhauled "Jeeps" 2, 51 and 57, with 10 under repair. Alongside 10, "W" class 2.6.0 No. 97 (possibly the last of these in traffic?) and two GNR 0.6.0s were also under heavy repair. Eleven more steam engines of both NCC and GNR origin were advertised for scrap, while W class 95 and 98 were hauled dead to be stored at Whitehead, never to run again. The Derry Road had seen little steam on passenger work in recent years, the majority of trains being AEC railcars, but the summer of '63 saw what might be seen as an Indian summer. The three S class locos recently acquired from CIE, and the busy summer traffic, saw up to 50% of the trains on the line in the summer being steam. As well as the S class trio, the remaining U / UG types put in appearances, especially the Posrtadown - Dungannon local. And this was to be the season that on several occasions, CIE B141 class diesels would grace this line as far as Omagh on Lough Derg pilgrimage trains. I believe, but I am not certain, that a CIE AEC railcar set did this duty at least once. On the NCC, steam took a further step backwards, with a noticeable increase in specials being formed of the various types of MPD railcars. From normal passenger service, steam was almost extinct on the NCC. On 27th May 1963, an MPD set ventured off the NCC for the first time with a 5-piece passenger special from Portrush to Dublin and back, while a couple of weeks later B165 took a CIE set on a Dublin - Portrush excursion. The MPD jaunt south was repeated a week after that. Steam activity on specials in the summer of '63 saw W class 91 do fourteen specials, ex-GNR 4.4.0s 58 and 60, "Jeep" 50 and W 104 also seeing action. GNR "T1" 4.4.2T: 187X As above (1). Of the above 57 locomotives, 18 were of one type, but the remaining 39 engines were of no less than thirteen types! Look at the GNR stock for example - no ex-GNR type had more than six members, and many were a class of 1 or 2. The summer Rosslare set was noted as being an AEC set (that much was typical) but with an old GSWR wooden dining car included. A cameo of workings on the Sligo - Limerick route in June 1963 saw a two-car AEC as the normal passenger set; that on Limerick - Tralee was the same formation. Single B121s were on the goods on this route, and on the main line to Sligo. The ballina branch train, however, had a C, usually hauling an old wooden bogie and a tin van. G615 was shunting in Ballina, while a C often handled the branch goods. In these times the Nenagh branch still was seen as the main line into Limerick. One typical train is recorded: B144 hauling a train of a Bredin, a Park Royal, three laminates, a dining car and a tin van. The ex-SLNCR railcar, now clad in CIE green, was working Limerick - Nenagh locals. The summer of 1963 saw busy traffic on weekend summer excursions from Castleieland to Fenit and back. AEC railcars dealt with this traffic. As autumn fell, the GAA's All Ireland Football Final would produce some interesting traffic as it has done from time immemorial to recent years. Nobody can convince me that there's anything even remotely interesting about getting a camera out for a Kerry supporter's special in these days - ehhh, oh, it's a 4 car ICR. Zzzzzzzzzzzzzzzzzzz. ALL the normal trains on that line are ICRs. But we're not talking about the glorified LUAS that passes for a railway today, all the way from Londonstrokederrybrexitcityderry to Cobh. It's September 1963, and no less than seven special s would leave Waterford for Dublin on All Ireland Day. But - with the recent closure of the Kilkenny - Port Laoise line, section occupancy was impossible on the main line for the normal service plus six specials all leaving within half an hour of each other. The solution was to send them up to New Ross - still open for goods, and beyond; the New Ross - Palace East - Macmine line had been closed since April but was not lifted. Thus began and ended 141 class operation over this line, as another remarkable feature of these trains is that they were all 141 hauled.B176 was first, then B147 left at 07:00, followed by B177, B158, B160 and a double-headed B148/B170! Autumn saw G615 alternating with a C on the Loughrea line, with its unique one coach train. Meanwhile, Inchicore's last two wholly-built coaches, two firsts of laminate stock, and the first Cravens, were out on test. Steam and Cravens had just missed each other; while all steam was gone months earlier, no Craven was yet in traffic. The first Craven was 1504, the rest numbered numerically after that. G617, the Tralee shunter / Castleisland goods engine, managed a rare passenger feat in September, when it took a two-coach special for an IRRS group on a rare non-stop run through Tralee, as it travelled from Castleisland to Fenit and back. One of the old GNR articulated Gardner railcars, No. 105 (ex railcar G) was still working on the Warrenpoint branch, but a single BUT car, 129, was also working on its own on off-peak Belfast - Portadown services. Every year, when the Orangemen and Apprentice Boys came out of the woodwork, many interesting railway workings would result. While 1962 had seen ex-GNR 0.6.0s predominate on the GNR section, now, with the recent purchases of a trio of S class from CIE, now-neglected filthy 4.4.0s were to the fore again. The last NCC "W" class 2.6.0, No. 104, did take a train from Sion Mills to Belfast, however. Passenger workings on the GNR by these locos was rare. As the year ended, a new dawn was about to break. If the railway hadn't been run down enough, the lowest ebb of the dark clouds of the Benson Report was about to appear. This would result in first, almost halving what little was left of the UTA network, followed by a new renaissance of the rest. All goods would go, along with the Derry Road and the Warrenpoint branch. But, out of the ashes, the new 70 class railcars would come, along with - at long last - the North's first ever main line diesel locomotives being planned. But that's for another day; 1963 is hereby put to bed, as will I quite shortly. Goodnight all; we awaken to 1964 when I'm in the mood. Amiens Street: J15 151, J15 132 and GNR 4.4.0 197. All three to be retained. Cork: J15s 118 & 251, to be scrapped. Limerick Jct. : 106, 125*, 130*, 164, 186* (all J15) & 351. * to be retained, others scrapped. Thurles: 104, 124, 195, 262 - all to be retained. Rosslare Harbour: 249, 461 - the latter to be retained. Dundalk: 255, 132N, 204N - all for scrap. Mullingar: 131N, 172, 599 - all for scrap, though 131 would live to be plinthed at Dundalk, and then operate again via the RPSI. Anything that went to Mullingar rarely emerged again! Sutton Tram Shed: 198, 261 - both to be retained. Mallow: 109, 116 - both for scrap. Sligo: 574, to be scrapped. Athlone: 159N, 593, 603 - latter two to be kept, 159N scrapped. Waterford: J15s 179 & 183, both to be retained. Inchicore: 80N, 111, 187, and the last Bandon Tank 463 - all to be scrapped. Why didn't they keep 463! What saved 131N was the plan to use it on the RCTS / SLS / IRRS grand last finale steam tour of Ireland the following spring! Of the above fleet, seventeen locomotives were in working order. Of the others, while officially in stock, theyw were also officially withdrawn from duty, and they varied from not operable to almost operable. Over the winter, 251 would be used in Cork to heat carriages in the early mornings before they set out, while 132, 151 and 197 were used for static steam generation in Inchicore. Thurles still saw a little steam over the winter, though, as the Sugar Company's No. 3, now preserved at Downpatrick, occasionally replaced the CSET's diesel. Elsewhere, even the CSET's nine Orenstein & Koppel locomotives were silent during the beet season. Instead, "A" and B101 classes dominated the beet traffic. By degrees, over the coming years, the 121 and 141 classes would also be involved. AEC sets were now gradually making their way to Dublin, but the Waterford line still featured them on the main line on some services. But the future of main line trains was now "A" and "Yanks". This would remain the general pattern into the 21st century, with the later additions of the 181s and 071s. And the "Flying Snail" was to be history! First introduced by the Dublin United Tramways Company in 1941, adopted by CIE in 1945, and retained after CIE's nationalisation in 1950, this venerable symbol would be henceforth replaced by - a broken wheel! The classic station colour scheme of green and cream would also be replaced by a new and very clean looking station livery of black, white and two shades of grey. As the new year of 1964 saw these bold new moves on CIE, north in UTA land it was all doom and gloom. William Craig, Stormont's Todd Andrews, remarked that railways would soon be as out of date as the stage coach, as the clouds gathered; rumours abounded that the Derry Road was about to go. Yet York Road still kept its steam fleet going - one each of classes W and WT (NCC) and S and UG (GNR) received attention. UTA: Goods: Steam. WT on NCC< old GNR types plus NCC W class on the GN. Passenger: MED sets on the Bangor line, AEC & BUT sets on the GNR main line, with some steam on the Derry line augmenting AEC cars. MPD sets on the ex-NCC sections. CIE: 121 & 141 classes absolutely monopolising passenger services everywhere, but AEC sets still to be seen on the Midland, DSER and Waterford lines. C class pilot / short goods, A class on most goods, though "yanks" would share this. B101 on almost totally goods, "down south", but also on all traffic on the Cork - Rosslare, a line which didn't seem to see much A, and no C action. This route seemed to be almost entirely the preserve of 121 and B101 locos, with an occasional 141. CIE Suburban: Cork area: Anything. Dublin: AEC cars, some C hauled. CIE Branches: Ballina: C class common enough here. Also A, 121, 141. Loughrea: G or occasionally C, especially when the G was away shunting Tuam during the beet season! By the early months of 1964, the 07:00 Ballymena - Antrim local was changed from steam operation (from Ballymena shed) to a single unit MPD car, which was now based at Ballymena as a "pilot engine" - remember, the UTA had no diesel locos apart from a couple of shunters in Belfast. This brought to an end the last REGULAR steam train on the NCC in its winter timetables. From now on, NCC steam would be either / or irregular, or summer only. A rare visitor to the Larne line was a CIE covered van spotted en route to Larne from Drogheda. This was 1211M, an ex-Midland Great Western van. Even in Midland days, vans from the NCC and MGWR would rarely have visited each other's territories. At this stage, goods on the NCC could be steam operated, or worked by MPD cars, giving an appearance of a mixed train, though the cars were empty of passengers. Three of them equated to a small diesel loco in power terms. A single unit railcar was also reported working on the Bangor line at this time. By now, the "Enterprise" was a mixed bag. AEC railcar sets were being used by the UTA, and loco hauled stick when heavier. In early 1964 this was often in the hands of NCC 2.6.0 W class locos. These are, by the way, often referred to as "moguls", a are other 2.6.0s. It's worth pointing out that like in America, where a 2.10.0 is a "Consolidation", this term relates to our narrow gauge neighbouring island. No Irish railway company ever referred to 2.6.0s as "moguls", or to 2.6.2Ts as "prairies", etc. In fact, I am unaware of any nickname for a wheel arrangement on any line anywhere in Ireland - can anyone enlighten me if there were? "Jeep" doesn't count, as the nickname was not directed at the wheels, and moreover no other 2.6.4Ts in Ireland were ever called "Jeeps". Little did readers know in the early months of 1964 that the writing was very much on the wall for the Derry Road. IRN published a "Station Survey" article about Omagh in January. This gave a potted history of the station, which I know will be of interest to some here! The goods yard was reported to remain busy, but at Omagh it was on a cramped site, and thus the old Market Branch had remained in use, and would do until closure. Several transfers of freight took place between the two at different times of the day. These would propel in one direction, haul in the other. In January, the new Shelton Abbey factory was rail connected. For students of "black'n'tan" era liveries, it is worth noting that it was in January 1964 that the "all-black" variation appeared. Up to now, all locos were black and full-waist-height tan. It was quickly applied to locos of A, B101, C and E class locos - though both liveries were to be seen for most of the 1960s, the black version later in some cases getting yellow patches (A & C class only). The only relief to the all-black was the white flash above end cab windows. Buffer beams were red - though several unspecified examples were seen with orange buffer beams - short lived. A17 was among the first to be seen in the all-black. Of the steam engines lying about, Dundalk's allocation had now all been scrapped. In February, the IRRS had an excursion (or as they quaintly say, an "outing"; a somewhat creepy term in this day and age!) to Warrenpoint. Brand new kitchen car 2403 was part of the consist, the rest of which was an AEC railcar set. A note on carriage interiors is included for a number of types. Sevearl brand new (the last laminate) first class coaches were mentioned as having sage green carpets. The new Cravens finally emerged on test runs, and they were described as having either blue upholstery in some, and grey in others. Floors were grey linoleum. I well remember this! Four more tin vans - among the last - were under construction. These were of the 4 wheeled type, and had both boilers and guard's compartments. February saw B1a 4.6.0 No. 800 heading north to Witham Street Museum in Belfast, where she would remain until her new home in Cultra was completed several decades later. With growing clouds over the GNR lines in the north, despite eight ex-GN locomotives having received attention at York Road, it was surmised that with fewer locomotives needed in future, heavy overhauls would cease on all but the WT class 2.6.4Ts. While some GN 0.6.0s would receive minor attention, this became the case over a short time. Several locos of various types were sold by the UTA for scrap, and two W class 2.6.0s, now unused, had their boilers and other spare parts removed as spares for the WT class. The old NCC Railcar No. 1, dating from 1934, received a full service and refurbishment. This car was being used for off-peak services to Antrim and Carrickfergus. In April, a special train took CIE officials up the NCC to Derry (Waterside). This was in preparation for the re-routing of Dublin - Donegal goods off the "Derry Road", in preparation for its closure. By Easter, the Warrenpoint line had strong excursion traffic, all steam, hauled for what the IRM correctly concluded would be its last fling. Finally, on 13th February, the UTA announced that it would close, along with the Derry Road; one of the greatest acts of official government vandalism in Irish railway history. The Stormont MP, William Craig, and some of his cohorts, with a delusional pro-road bias, and not the first clue about public transport administration, let alone how to serve the rural people who had voted for them, must bear responsibility for this. Today, the Derry Road at least would be busy, and the rail connection into Newry, rather than Bessbrook-at-the-top-of-the-hill, would be a boon. All night freight services were also to be stopped, and local internal UTA goods trains wouldn't be far behind. Craig was questioned in Stormont about providing an airport link at Aldergrove. He said he had investigated it, and it was unrealistic. Quite; when I was at school I recall an expression being used, "What do you expect from a pig, but a grunt!". The 03:15 Portadown - Omagh goods train had been officially cancelled for some months, but still operated as a special four days a week usually! Further south, an intrepid traveller found the usual Limerick - Ballina set to be a luggage van, two laminates and heating van. B133 was at the head one day, and the set also included a horse box. It might be worth pointing out that no horse box was ever painted in any variation of a black'n'tan livery. They seemed to have all died out, still in faded green. Goods trains on the Limerick - Claremorris line was variously B141s and "A"s. A typical Westport makeup was recorded as a B121, a dining car, a compo, a second, two tin vans (one luggage, one heating) and another standard ath the end - all of laminate type. A scathing article in IRN - again, in contrast with virtual silence from the IRRS Journal - pointed the finger firmly at the UTA, the Transport Tribunal, Craig and above all the Stormont Government with regard to the Derry Road closure, and their absolute refusal to listen to any economic or social argument. The article states that the decision to close was "purely political...which identifies itself with the Stormont policy of isolating the North from the South". And these people had never heard of Brexit, and the positions taken over this by some elected representatives today! Plus ca change...........! Glanmire Road station in Cork was refurbished with the new now-familiar city terminus white and black platform tiles. However, what would become the standard CIE station name board - black letters on a white background - was also unveiled there for the first time. These signs were virtually everywhere when I did a lot of my earlier CIE travels during 1975-80. At Inchicore, C234 was to receive a Maybach engine instead of the unreliable Crossley one; two "C"s would be thus treated. Against this modernisation, redundant steam engines were still kicking about - four rusting J15s were shoved into a siding near the goods shed at Thurles. By now, 25 of the 40 Cravens were in traffic, all so far on the Cork main line. The "wasp stripes" were now appearing on guard's vans lookout duckets. They were black and yellow, not black and white as in Cultra! On 24th September, a melancholy procession set sail from Cork to that point of no return, Mullingar scrap sidings. To A8, the funereal duty was entrusted; with a Crossley engine, it's a miracle it made it. In the train were 41 old wagons, the erstwhile Mallow breakdown van, and the very last eleven six-wheel carriages to have been withdrawn from service about a year earlier. All were of MGWR origin. Within weeks, the entire lot had been burned and the resultant scrap sold off. Growing road traffic could sometimes benefit the railway. Increasing ownership of cars was rendering parking difficult in Loughrea, so the normal one coach and G formation of the train was replaced by a C and two laminates for the summer of 1964. As a result of the closure of the Derry Road, goods into Sligo for Donegal was showing a marked increase. The former one goods train a day was now increased to three, with different destinations en route being served by each. The All Ireland final between Kerry and Galway provided the usual flurry of activity, but this year, six specials were double headed by 141s, with another special headed by one 141. The day didn't stop there; there were three specials heading the other way too, to Knock! One has B133, while the other two had pairs of 141s. One of the GAA trains was a set of nine ex-GNR coaches. Normal trains tried to fit in around all this lot - 141s and (in the case of Waterford) AEC railcars sets dealt with this. Meanwhile, A and B101s spluttered about with goods. Among UTA coaches now withdrawn and set aside for scrapping were the company's oldest coaches - four old non-corridor bogies built by the Belfast & Northern Counties Railway in 1896. Many NCC and GNR coaches of those remaining in service were being done up internally, with new formica panelling replacing the old wood panels. New standard UTA green upholstery - same as in the buses - was being used, and repainting externally completed a smart appearance. Three hundred of the Authority's old, dishevelled and clapped out wagons were being rebuilt and repainted in Belfast - with the impending end of goods transport, one might wonder why! By now, "Jeeps" were the only locos receiving anything but the most basic attention, and it is hardly surprising that in the line's final months, they were appearing on the Derry Road. They were also making appearances in Dubloj, along with the now-shabby ex-GNR 207 "Boyne", which continued on Belfast - Dublin specials. On the NCC, all the orangemens' trains were Jeep hauled, while on the GNR, the same traffic was managed by two W class 2.6.0s, two Jeeps, and one GNR 4.4.0 - all of which ended up in Foyle Road, leaving the Strabane pilot as the only other operational W class! Thirteen specials and 95 carriages operated throughtout the UTA that day. But GAA, Knock and Orangemen weren't the only customers for special trains. AEC railcars were seen operating over the Belfast Central into Bangor on a number of occasions, as did GNR 0.6.0s on some specials. Football (soccer), seaside, and Sunday School groups were the customers. A number of MED and MPD railcars sets were swopped between the Bangor and NCC sections. The latter were for use on the Larne line. By the autumn, the beet campaign loomed; but this year, Carlow would have none by rail. By the end of the year, all but eight of the new Craven carriages were in service, all being described as setting new standards of smartness. Well maintained, this is true still, half a century later, on RPSI or Railtours Ireland specials. As the Cravens appeared, a pogrom took place on older wooden carriages. The last of the six wheelers have been mentioned, but one other inexcusable act of vandalism by CIE was the destruction of the old GSWR Director's Saloon, No. 351, and with it probably the single most luxurious railway carriage ever to run on Irish rails - the 12 wheeled MGWR Director's Saloon, No. 346. Reduced to ashes by having petrol thrown through them, and a match struck. Two steam engines remained at the end of the year providing steam for heat: J15 118 in Cork for steam heating trains early in the morning before use, and J15 130 in Inchicore to provide heat in the diesel maintenance shops. A bizarre development was that some whistles from scrapped locomotives were being refurbished at Inchicore as consideration was being given to fitting them to A class diesels on an experimental basis! And 1964 came to a close; the "swinging sixties", this fascinating blend of old and new, were half way through. In those "happy" days, my annual season for Crusaders FC in the Black North was 10/6 or 52.5p, say 60 cents! For that, our centre forward (Danny Hale) knocked in fifty goals during one season in the Irish League! Now Danny was a member of the (True?) "Old" religion and the prod supporters of the ultra orange Linfield used to sing at him "Hale, Hale, The Pope's in Jail". Danny found the perfect answer and put the ball in THEIR net! Oh, I didn't mention that the East terrace at Seaview was perfect for watching NCC steam trains as well! Trains seemed to go past very slowly on match days! 1964 completed above.... 1965 to follow. The former GNR diesel, now CIE’s K801 (another “800” class!) had done little work since CIE got it. One wonders what the UTA might have used it for, had they got it in in 1958? Probably shunting at Great Victoria Street….. However, towards the end of 1964 it had been in use on the Cork suburban services before it was sent to Inchicore for repairs. Lengthy delays in getting the right spares from Germany resulted in a long layover there, but in the New Year it was ready to go back. However it failed while running light back to Cork, having only made it as far as Sallins, so it was back to Inchicore. The thing rarely turned a wheel again, despite being repainted from CIE green to the all-black CIE livery it bore on the only occasion when I ever saw it. By the spring, there was a clear distinction in the diesel fleet. Passenger services were still AEC railcars in some cases, especially on Greystones to Dublin, and Dublin – Howth and Dundalk; but Waterford used them on main line trains too. Elsewhere, virtually all passenger work, including Cork suburban, was loco-hauled, absolutely dominated by the 121 and 141 class. On the other hand, most goods was A class. A pair of “yanks” was a rarity on goods, but in the early part of the year, when so many As were in use on the beet, the 20:10 Kingsbridge – Cork goods regularly had a B141 class “pair”. Location of a new fertiliser siding at New Ross was identified by the nearest milepost, in accordance with normal practice – but it was noted that this indicated that it was 102 miles from Harcourt Street; as a former DSER line, despite now being unconnected with Macmine Junction and the rest of the DSER, the original DSER mileages were still in use, measured from the erstwhile DWWR terminus, now closed for almost 7 years. Goods traffic was reported to be buoyant on the CIE system in general, with much talk of new traffic to Foynes, New Ross and other places. In great contrast, the Derry Road goods had breathed its final; despite being equally buoyant, thanks to Stormont’s inexcusable closure of this route for malevolent political reasons. Meanwhile, on the GNR main line – about all that was left – the unique former GSR “Bredin” all-first 1144 was noted in the CIE “Enterprise” consist. It was living out its elder years in style – it was noted a few days later on a Cork express! On 4th January, a new “Enterprise” service was added, consisting usually of a B121 with the following make-up: “Laminate” all-first, a matching dining car of the 24xx series, and three or four Cravens – the first use of these on this service. Various parcel and tin vans took up the rear. Just after Christmas 1964, and into January 1965, a little-reported and highly unusual visitor to Great Victoria Street was the former SLNCR railcar “B”, now CIE 2509. The previous year it had been in use on the Nenagh branch, but was now being used for a short time in crew training. It set sail from Amiens Street in this capacity, using goods timings to reach Belfast. Has anyone got a photo of this unique vehicle passing through Goraghwood, Portadown, Lisburn, or in G V Street? It is noted that this continued until 1st January 1965, at which time the “Enterprise” is noted as an AEC set – this must have been the UTA one. Now – get this; the MOST peculiar operation EVER, I am sure without chance of contradiction – was that on 1st January a goods train ran out of diesel on Kellystown Bank near Dundalk. The resultant disruptions to the Enterprise and Dundalk-Dublin local trains, meant that the SLNCR railcar was pressed into use on its crew-training return, and it took a connection out of the Enterprise of ten passengers at Drogheda, for Dublin. After that it entered another period of storage, and would see little more use, apart from a spell in Waterford in 1966/7. It was noted too that the heating inside it was working too well – the thing was like a microwave, whereas the passengers had just got off a poorly heated train! 3rd January saw the final closure of all internal UTA goods trains, the Derry and Warrenpoint lines, and the Dungannon – Coalisland branch line, as well as all stations between Portadown and Dundalk. The modern “Newry” station (actually the old GNR Bessbrook one) had already closed, so Newry would have no rail service at all for several decades until NIR would reopen Bessbrook, rebranding it as Newry. York Road had given heavy overhauls in recent times to no less than nine WTs, or half the fleet of them. Other than that, ex-GNR 0.6.0 No. 49, and the SLNCR “Lough Erne” (used as York Road shunter only) were the only other locomotives serviced. Little else was needed now. British Rail’s Swindon and Derby works were reconditioning several “Jeep” boilers too. With the ex-GNR locomotives on the Derry Road having been deliberately run down, four Jeeps (1, 7, 8 & 9) which were normally on the NCC had been transferred into the GN section to assist, particularly with heave cement traffic coming from Dundalk (originating in Drogheda). A six-coach AEC set formed the last passenger train to leave Newry (Edward Street), while three ex-GN coaches hauled by 0.6.0 No. 40 made up Warrenpoint’s last train. On the NCC, Courtaulds coal traffic to Carrickfergus continued for a while longer, as did fitted van trains to Larne Harbour. The coal trains were worked by Jeeps, and the fitted goods by pairs of MPD cars. Fitted goods trains to and from Derry (Waterside) were also hauled by MPD cars – usually two, but sometimes three. An MPD car was usually used to shunt in Derry. With Goraghwood gone now, steam working south of Portadown ceased. The Enterprise services were now CIE loco hauled, with two return trips formed of the UTA’s ex-GNR AEC railcars. No locomotive swops therefore took place at Dundalk any more – the practice had been for a few years to have some services hauled by 121s as far as Dundalk, and UTA steam locos north of there. Now, goods was CIE diesel-worked to Belfast, but the Derry goods was taken by CIE diesel to Lisburn where MPD cars hooked on to take it onwards up the otherwise abandoned Antrim branch onto the NCC. The UTA temporarily closed the Belfast Central, due to the removal of a bridge to facilitate a road construction. However, the UTA being the UTA, it would not re-open until NIR days (1976). Four coaches were upgraded by the UTA, all of NCC origin. Steel-bodied coaches were absent on the UTA, and would not appear until NIR introduced them in 1970, so everything they had was steam-era wooden. But they tended to introduce modern formica internally, and new upholstery – I remember some looking quite smart and feeling confortable – others, I have to say, smelled strongly of damp, being stored outside and seeing little use over winter. Another 12 were to be done – the entire lot of side-corridor stock, and all of NCC parentage. While steam passenger trains had disappeared from regular service entirely, peak-hour extras and excursions still required a stock of loco-hauled stock. However, new stock was on the cards. What would become known as the 70 class railcars were to be ordered for delivery in 1966. These would consist of two six-car sets for the NCC main line, another 3-car set for the Larne line, and two spare power cars. The ex-GNR railcars used by the UTA on the Enterprise were showing their age and high mileage now, and the BUT cars were seen as noisy and less comfortable. My own recollections of AEC and BUT cars were that they were comfortable seating-wise, but undeniably noisy at times, especially when accelerating, and they could be poorly heated in winter. Thus, of the four sets used to provide the serice, only one was a UTA set. CIE provided the others, though one of theirs used a UTA dining car due to a complex series of manoeuvres. These were 121 or 141 class locomotives with a mix of ex-GNR stock (now in black’n’tan), laminates and Cravens, with sundry tin vans. Following the UTA closures, extensive timetable amendments were made on the former GNR, but south of Dublin the use of new stock had resulted in speeding up of many services, and major timetable expansion and alteration was also done there. The railway seemed to be facing into a new era. Yet, it was noted more than once, despite the UTA’s history of anti-rail, pro-bus policies, its publicity machine for its remaining rail services was light years ahead of an apparently indifferent CIE publicity department! However, just as today, the neglect by CIE (and IE!) of cross country routes was as wilful as Stormont. The Rosslare – Mallow and Waterford – Limerick lines had poor and infrequent services – one each way per day, and a second in summer months only. As a train service, that was (and is, sixty years later) little better than useless. In 1965, AEC sets were still employed on some main line trains on the Waterford and Sligo lines. May saw the closure of the Guinness brewery rail system. Within the last month, 0.4.0ST No. 2 had still been in use when a car collided with it on St. John’s Road! This month saw a CIE AEC set form the Enterprise on one occasion, as a result of a breakdown elsewhere. And the bubbles were in traffic – between Castlemungret and Cabra. The older cement hoppers were being used between Limerick and Athy. Castlemungret was loading 180 wagons per day. A five coach BUT set, a six coach one with two vans, Jeep No. 8 with the goods. The down 20:05 was a three coach AEC set. The last down train of an eight car BUT set broke down just as soon as it had cleared the platform in Great Victoria Street, but the leading car was replaced and on it went; enthusiasts present had hoped that steam engine might have been substituted! Following the closure, pilot engines remained at Foyle Road, Strabane. Omagh and Dungannon. The last railcar into Derry had left at 00:21 to go back empty to Belfast. Three days after closure, the pilot engines had been steamed to clear all remaining wagons and stock held in sidings. The three stations in Co. Donegal (Porthall, St. Johnston and Carrigans) had been closed by CIE too, but a day earlier as they had no Sunday trains. Thus, their last service was the last Strabane - Derry local on the Saturday, consisting of “S” class 4.4.0 No. 60, two carriages and a van. This resulted in major changes in the workings of the UTA railway, as it had been just about halved. Moreover, the need for steam traction had been greater in the GNR area than the remaining NCC, as goods traffic was much heavier – indeed, the Derry Road carried the bulk of the UTA’s goods, and right until closure, goods trains over the route were heavily laden. Following the closures alluded to above, but a single engine (a “Jeep”) was kept as a pilot / spare engine at Portadown. The large roundhouse there would soon be redundant. Great Victoria Street had “S” class 4.4.0 No. 66 as pilot – and as far as the GN was concerned, that was that steam wise. On the NCC, just the Courtaulds coal traffic was left, worked also by Jeeps – the “spoil trains” were not yet running! Another Jeep shunted York Road. I remember it…. No scheduled passenger trains anywhere were now steam, though a few surprises could still be thrown up with excursions or extra workings. The last of the large GNR express locos, Vs 4.4.0 No. 207 “Boyne” remained in traffic, though in an increasingly dishevelled state – the UTA never repainted it in their livery, and it bore the now unsightly, faded and filthy GN blue. As an added indignity, its nameplates had been removed and replaced by wooden ones with the name painted on. The Lansdowne Road rugby specials saw it in action in April on specials from Belfast. Jeeps 4, 10 and 52 were all in action on various sports-related specials into the summer, both on the GN and the NCC. Six ex-GN 0.6.0s, three ex-GN 4.4.0s were now stored, withdrawn, at Portadown Shed, in the company of Jeeps. However, one of the two remaining W class had new cylinders, and ex-SLNCR “Lough Erne” had received attention at York Road. Steam was not dead yet! Two unusual ballast workings were noted during the summer. One was a routine one operating south of Portadown, but what was unusual was the motive power – No. 207! More bizarrely, a ballast train was seen on the closed Portadown – Annaghmore stretch of the “Derry Road”. Why would a ballast train be wanted on a closed line, and one with well maintained track? Answer: to bring stone to several locations where accommodation crossings across the track were to be upgraded to proper roads once the track had been lifted. A strange one! A visitor to the south west in the spring found B169 in charge of the North Kerry goods, with 21 wagons plus van. G617 was working coal trains in from Fenit to Tralee. By this stage, for modellers, open wagons in use were about 40% old wooden ones, and 60% corrugated “Provincial Wagons” opens. Beet traffic would have been similar. By 1970 or so, the wooden ones were rare, if not disappeared. B152 was working in the other direction, the two crossing at Listowel. The northbound train was 40 minutes arriving in Limerick, almost all of this due to a tar tanker which was detached at Lixnaw. These tankers were elderly, and subjected to a speed limit. In addition, the shunting procedure at Lixnaw was complex due to the restricted track layout. At the same time, the trains to Wexford and Rosslare (DSER) were reported to be a mix of 121 class and AEC / BUT railcar sets. The Mallow – Tralee line was still mostly AEC cars too, as were Tralee – Dublin expresses. Mid May saw the final closure of the Guinness tramway in Dublin, as previously mentioned. No. 3 worked the last train, as the broad gauge diesel, No. 4 was out of use. A few days later, No. 3 was steamed to take 2 and 4, dead, across the road to Kingsbridge. No. 4, of course, ended up in Whitehead where it remains today, in fine form. Note for modellers: it currently carries a shade of blue much lighter than it would have had in Guinness’ days. In its original state as first built, it was dark olive green with some of the motion in red, as per the 1’10” gauge Guinness loco in the Guinness Storehouse in Dublin. During the summer, the steam engines abandoned at various locations mentioned earlier were being brought to Mullingar (B151 having been noted towing two old Midland 0.6.0s there) and Inchicore. That would be an interesting working on a layout – a shiny 141 hauling a dead and shabby steam loco away to the scrappers…. tissues, please! Two Bredin compos (2116/7) were seen in the summer of 1965 working as railcar intermediates in ex-GNR AEC railcar sets on the Dublin – Dundalk route. While the UTA tended to include old steam carriages in MPD consists and occasionally MED ones on the NCC, their share of GNR cars tended to use whatever stock the GNR had used with them. CIE, like the NCC section, had all manner of things as AEC intermediates. Old wooden bogies had been used, and there was a short lived experiment with (I think) two Cravens used as such. The last of 500 palletised wagons were being turned out of Inchicore meanwhile. On 29th May, an unusual IRRS trip took place. C206, later to be an occasional visitor to the Loughrea branch, took a train across to Albert Quay and back. An old wooden brake second was used, but with it, despite being withdrawn – six-wheeler 39M; this was the last time a six wheeled coach was ever used to carry passengers. 39M was one of the last clutch of these things which had been retained for excursions in Cork. Most of the rest had been sent to Mullingar to be scrapped, as mentioned earlier, and a few survived into departmental use. Five years after closure, lifting of the West Cork was completed in the summer. Lifting trains were still active elsewhere in the sections from Clonsilla – Navan and Ballylinan, with lifting due to start between Streamstown and Clara (abandoned for many, many years, but not formally abandoned until quite recently), the North Wexford line, and the short Ardnacrusha branch. On 26th July, with G614 in attendance as shunter, the first trainloads of fertiliser left Shelton Abbey. SLNCR 0.6.4Ts Nos. 26 and 27 (26 was seeing little use) Shunting at York Road only. Thus, in mainstream use, we now see seventeen Jeeps, and four GNR 4.4.0s. Even at this, the thinking was that by the end of the summer, many of the above would also not be needed and would be scrapped. This isn’t long before their saviour, the spoil contract, had been announced. Had this never happened, it is probable that over the winter all but three or four Jeeps would have been scrapped. From mid-April to mid-June, the Enterprise reverted to steam working between Dundalk and Belfast, a 121 usually having it south of Dundalk. 207 was also in use on Belfast – Dublin excursions again. In July, new “sectional” liveries were introduced by the UTA. It is worth noting that when the UTA was dissolved two years later, these had still not permeated the whole fleet, and as I recall very well, much if not most was still in the dark green livery. However: Bangor line MED sets acquired a new light olive green and cream livery, while on the GN section a mid blue (similar to GN loco blue, but much lighter than GN coach / railcar blue, was used. Cream upper panels, with blue above that, and silver-grey roofs completed the picture, Short lived it might have been, but it looked very smart as I recall. AEC / BUT cars meant for local services had a thinner cream band at window level, with “main line” ones having the cream extending to just below, and just above, window level. The blue was dipped at the front, in the same way as tan on CIE “A” class locos. NCC section railcars had maroon and light grey; this would later become the new NIR livery with few alterations. I could be wrong on this, but recollection suggests that the maroon was marginally lighter than that eventually adopted by NIR in 1968. As mentioned before, a certain number of steam-era carriages had been retained and refurbished. These were classed as “Class A” carriages, and were to be plain maroon. (NIR would later add a 3” light grey line below window level). Other carriages remained in the old UTA green. An indicator of the still-varied traffic carried by the railway was given by the record of a northbound train on the DSE section in the charge of B122. As well as the seven coaches, a loaded fish van took up the rear. Its counterpart in the down direction was a three-coach AEC set. In 1965 almost 600,000 tons of cement was carried by CIE, or 25% of ALL rail freight. We now had the bubbles, but also much was carried in “H” and “Palvans” – standard covered vans, a good few old wooden ones also included. It was noted that this traffic “just exceeds the total of the two next heaviest traffics – beet and artificial manure”. Amidst the destruction of the Derry Road, with two old GNR Gardner railcars in use on the lifting train, as well as a Jeep, the temporary saviour of steam was announced. Seventy side-tipping “spoil wagons” were to be ordered for delivery in 1966. Elsewhere, construction had commenced of the new diesel-electric railcars, which would come to be known as the “70 class”. The tide was now turning for what was left of the railway, and the UTA was belatedly following CIE in a modernisation programme, Unfortunately for much of its route mileage, it was too late. One wonders how the Derry Road, Dundalk – Enniskillen – Omagh, and Belfast – Downpatrick – Newcastle would have fared with modern fast diesel trains. The Inchicore trial train still had a workshop coach in its midst – 662A. This had formerly been dining car 74D – probably the very last ex-DSER vehicle in use. A late survey of the Mallow-Waterford line found the following in use – B152 (with a train of laminates, but a GSWR 12-wheel diner 353 included, plus two tin vans and two fitted “H” vans. The dining car had been tastefully adorned with Christmas decorations. A25 was crossed at Lismore with a beet special. It was noted that up and down main line trains at Mallow had both been double headed 141s. Black and Tan sheer heaven! The year ended with severe floods – the worst in living memory, with sections of Mallow-Waterford, Limerick – Ennis, and near Longford all blocked. Floods and downed power lines all added to the chaos. The Rosslare Express had to operate via Limerick Junction, but the Sligo line was worst disrupted, with widespread bustitutions. An AEC set took four hours to get from Longford to Dublin; it was too late to form its return train, so B173 replaced it with a set of 5 laminates, two tin vans, and a GNR-origin dining car. One unusual working was B152 hauling a dead 6-car AEC set from Dublin-Sligo. The same set was hauled another day by an A class. B125, B130 and B123 were also noted, in each case with trains of 3 or 4 laminates and tin vans. The 121 class were to be regulars on the Sligo line for some 15 years. The Westport line was similar with AEC sets on some mainline services, but 141s primarily on loco-hauled ones. One train was reported as a three-car AEC hauling a goods van and a tin van. In the coming days, the area between Bray and Greystones, and the notorious Ballygannon, suffered severe delays due to extreme weather. Without delving into every delay and special working, it’s worth noting the make-up of trains. One set was a four coach ex-GNR AEC set with two tin vans. B133 and B160 were on up and down goods trains. One set on one day was a 121 hauling a BUT railcar set. For nine days there was chaos….. I hope that the foregoing has given a flavour of the world into which the IRM “A” class locos lived. They entered a railway full of variety, with many routes still open that are long history. They worked traffic that many today would be almost unaware of. “A” class locos worked the North Kerry, Mallow – Waterford and other places…Ardee… One went on a test run down the West Cork, though they never worked there; another got as far as Monaghan via Cavan, and yet another got into Carrickmacross, I think, with a goods train about 1958. Their more recent history is better known, thanks to the increasing presence of prolific photographers and the internet. The above articles have related to the period from 1960 to January 1966. When I get time I’ll go back in time, and do 1955, the arrival of the “A” class, to 1960. If anyone is still awake, I’ll eventually do 1947-55. That's interesting about 207 still working Belfast-Dublin excursions in the summer of 65. My early railway memories possibly earlier than 65 was of a big blue steam loco leading a long train across the viaduct at Gormanstown Strand and dark green trains without an engine at the front. For years I thought that I had imagined seeing a big blue steam loco until I saw a colour slide of 171 about 10 years later and borrowed a copy of Colin Boockocks irish Railway Album from the library complete with several photos of 207. Ours was firmly a car and bus family, my first train ride was around 69 or 70 in a compartment coach with wooden paneling behind a black noisy diesel from Killiney to Tara Street. Yes, that was one of the 2 (or 3?) rakes of old wooden coaches kept for excursion use. They were all, as far as I know, ofswr origin - mostly corridor but a few non-corridor. Several survive - the DCDR's 837, now restored and in use; 1287, which is the staff room on the DCDR but not operational, and I think 1142 and 1097 may have come from that source too. I never travelled in them, but I certainly remember the black noisy diesels, and the noisy exhausts of the AEC, BUT and MED railcars!